THE TRIAL OF Solidarity TD Paul Murphy and six other water charge protesters has heard they were “plainly involved” in restricting the liberty of then Tánaiste Joan Burton in 2014. Murphy (34), together with South Dublin councillors Kieran Mahon (39) and Michael Murphy (53) and four other men have entered not guilty pleas at Dublin Circuit Criminal Court. They are charged with falsely imprisoning Burton and her adviser Karen O’Connell by restricting their personal liberty without their consent at Fortunestown Road, Jobstown, Tallaght on 15 November, 2014. Sean Gillane SC, prosecuting, told the jury of five women and seven men the charges against the seven men should not be confused with kidnapping or the taking and carrying away of someone. The offence involves the intentional or reckless restriction of a person’s liberty without that person’s consent. It does not require that a person be put in a prison and can include being restricted in a car, he said. Opening the prosecution case, Gillane told the jury everyone is entitled to political views and opinions and to express such views with gusto and energy. He said a political motivation or grievance did not grant immunity from operation of the law. “A view is no more privileged or worthy of protection because it is shared by people in power or because it is held by people in protest,” he said. Gillane described how Burton and her adviser allegedly had eggs and water balloons “hurled” at them while attending a graduation ceremony at a further education centre in Jobstown. Arrangements were made for them to leave by a side entrance and to get into a garda car, but it was immediately surrounded by anti-water charges protesters. The vehicle was banged on and there was shouting and roaring, Gillane said. Members of the garda public order unit arrived and Burton was moved to a garda jeep “by means of a human cordon”. This jeep was also surrounded and unable to move, Gillane said. The then Tánaiste and her advisor were trapped in the jeep for around two hours. Ultimately the vehicle was moved very slowly and Burton and O’Connell secured their departure by running to two different garda cars. Counsel said it was the prosecution’s case that the seven men were “plainly involved in the restriction of liberty” of the two women. The court heard that Burton would be the first witness and is due to give evidence tomorrow. Paul Murphy of Kingswood Heights, Tallaght; Mahon of Bolbrook Grove, Tallaght; Michael Murphy of Whitechurch Way, Ballyboden, Dublin; Frank Donaghy (71) of Alpine Rise, Tallaght; Ken Purcell (50) of Kiltalown Green; Michael Banks (46) of Brookview Green, Tallaght and Scott Masterson (34) of Carrigmore Drive, Tallaght have all been arraigned and entered not guilty pleas. The trial continues before Judge Melanie Greally. Email “Paul Murphy 'plainly involved' in restricting Joan Burton's liberty, trial told”. 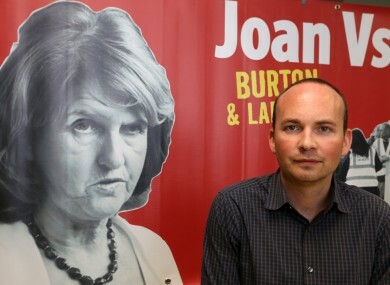 Feedback on “Paul Murphy 'plainly involved' in restricting Joan Burton's liberty, trial told”.